Animal organs. Respiratory system. Atlas of plant and animal histology. The respiratory system is responsible for providing the oxygen needed for cellular respiration and for eliminating the carbon dioxide generated during cellular metabolism. Both molecules are exchanged between the blood and the air. The respiratory system also performs other functions, such as providing air to produce sounds, renewing air over the olfactory epithelium of the nasal cavity to allow olfaction, and it also produces certain hormones. The respiratory system is formed of a series of ducts through which the air circulates. It starts in the oral and nasal cavities, since both are airways through which air enters and exits. The nasal cavity contains the olfactory epithelium. Olfaction is closely related to breathing in pulmonary animals, and sometimes the rhythm of breathing is altered to increase the uptake and perception of odors. The pharynx provides a communication way between the oral and nasal cavities and the larynx. It acts as a resonance zone during the emission of sounds. The larynx connects the pharynx and the trachea. Apart from being an air conducting structure, the larynx is the phonation organ since it contains the vocal cords. The trachea is a tubular structure that starts in the larynx and ends in the thoracic zone, where it branches out into two tubes that are called main or primary bronchi. The trachea is lined with a mucosa composed of pseudostratified ciliated epithelium, containing some goblet cells (mucus producing cells), and a lamina propria of connective tissue with many elastic fibers. More externally, there is a submucosa constituted by connective tissue that contains the secretory portions of some glands mostly formed by mucous acini, even though some are mixed (serous and mucous). Underneath the submucosa there are incomplete rings of hyaline cartilage, which in cross-sections (perpendicular to the major axis of the trachea) are C-shaped. These incomplete rings are distributed along the trachea. The muscle cells of the trachea connect the ends of the incomplete rings and contract during coughing, reducing the size of the lumen of the trachea to increase the flux of airflow. The cartilage provides rigidity and elasticity to the trachea. The adventitia limits the external part of the cartilage. Primary bronchi are the first two branches of the trachea. They, in turn, divide into the secondary bronchi, and later into bronchopulmonary segments, according to the lobes in which each lung is divided into. The bronchi have the same histological structure as the trachea, but when they enter the lungs, irregular cartilage plates replace the cartilage rings. While the diameter of the ducts reduces, and after successive ramifications, the cartilage diminishes. At the same time, the smooth muscle layer increases. When the diameter is approaching to a millimeter, the cartilage is no longer observed, and then the ducts are called bronchioles. Bronchioles give rise to terminal bronchioles, which in turn give to pulmonary alveoli. In bronchioles, there is a transition from pseudostratified to simple epithelium, which also changes from simple columnar to simple cuboidal, until reaching the alveoli, where it is simple squamous. The goblet cells are scarce in the bronchioles and do not appear in the terminal bronchioles. 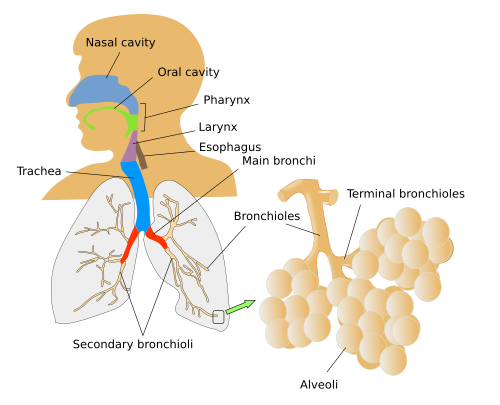 Alveoli are the terminal zone of the airways in the respiratory system. The gas exchange takes place inside them. Alveoli are formed by a simple squamous epithelium surrounded by blood capillaries. The internal cavity of the alveoli communicate with the alveolar sacs, or with the alveolar ducts. The walls of alveolar sacs and alveolar ducts are the alveoli themselves. Both structures communicate with the bronchioles.